The orpington girls have got so big!! I knew they were going to big but wow they are huge. I love orpingtons I think they look like Victorian ladies with their large tails and fluffy skirts. I love the way chickens run towards you like mini T-rexs haha. When they run I always expect the ground to shake. When you pick them up and look at their legs and heads you realise how reptilian they really are. I love how they sit in front of you when you walk towards them (I think this is a defense mechanism? though not a very good one). They never did this until they started laying so maybe a peaking order thing? Anyways it makes them super easy to pick up. Normally Nero only does this for John so she is now his chicken. 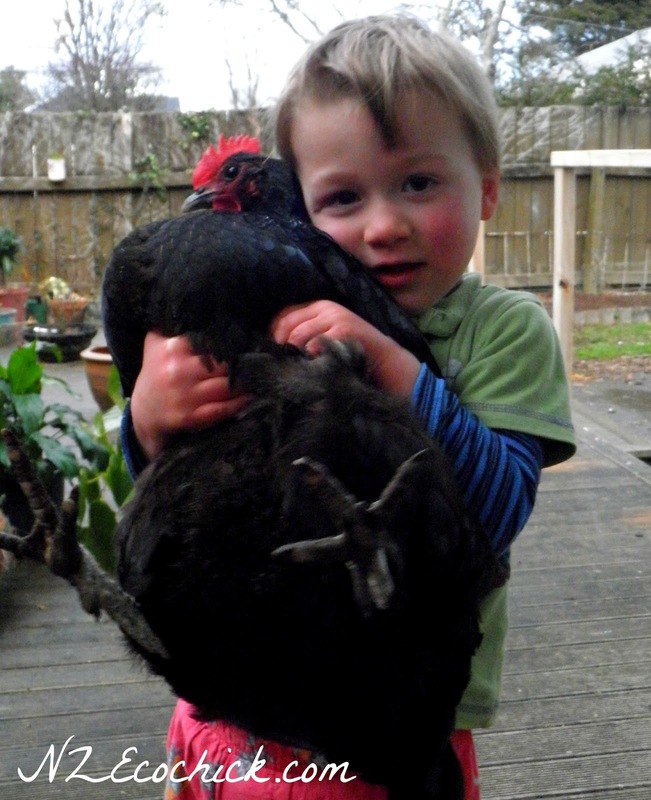 Often I find him walking around the garden holding this huge bird! Poor Nero since John is normally holding her with fists full of feathers rather than how we’ve showed him though Nero doesn’t seem to mind too much. I’m very happy to announce ALL my girls are laying. Woop woop fist pump. Yes I’ve had four days of four eggs a day!! Olive was the last to lay and so since she’s started laying I’ve had one day with two eggs and the other four days I had four eggs. Yep four eggs!!! Boy are four chickens noisy at laying time. Of course they all want to use the same nesting box at the same time!! I’ve even seen Chive try to sit on Nero. Ha ha Chooks are so funny. I want to share this MASSIVE egg Sage lay today. It is a wooping 94 grams!! !I weigh my eggs most days; Sage normally lays eggs 68-79grams. Nero and Chives eggs are normal around 58-68 grams and olives are in the 50s. Sage’s egg today is off the eggs scale. According to the egg producers federation; a Jumbo egg (8) is 68g, large (7) 62g, standard (6) is 53g and medium (5) are 44 grams. So my girls on an average day are large to jumbo eggs so what does that make Sage’s egg an extra jumbo? Wow imagine if they were all like this every day. Wow! I’m so proud of my girls and really never get tired of looking the nesting box and finding! Hi Madeleine, your ladies are absolutely stunning! The reason they crouch like that once they get to laying age is in case you’re planning to mount them! Yes, it’s a reflex so Mr Rooster’s energetic attentions don’t knock them over. Tee hee. looking good Madeleine, now what are you doing with all those eggs?